TOKYO – Toyota Motor’s operating profit surged 43 percent in the latest quarter as cost cutting, lower selling outlays and falling warranty expenses offset unfavorable foreign exchange rates and helped pilot Japan’s biggest automaker to a record full-year net income. Operating profit rose to 629.6 billion yen ($5.93 billion) in the carmaker’s fiscal fourth quarter ended March 31, while net income advanced 21 percent to 480.8 billion yen ($4.53 billion). Revenue rose 1.9 percent to 7.58 trillion yen ($71.36 billion). Global retail sales increased 2.2 percent to 2.6 million vehicles in the January-March period, including results from its Daihatsu small-car subsidiary and truck-making affiliate Hino. Worldwide wholesale volume declined 1.8 percent to 2.3 million. In announcing the earnings results May 9, Executive Vice President and CFO Koji Kobayashi credited companywide cost control and restraints on spiffs and marketing expenses for the uptick in quarterly profit. Results were also lifted by a 145 billion yen ($1.37 billion) thanks to lower outlays on quality-related issues such as the recall of faulty Takata airbags. Foreign exchange rates dragged on Toyota’s fourth-quarter earnings. The Japanese yen’s appreciation against the U.S. dollar and other currencies lopped 30 billion yen ($282.4 million) off quarterly earnings. But that was offset by cost cutting of 30 billion yen ($282.4 million). Weak performance in North America, Toyota’s traditional cash cow, undercut global results. North America booked an operating loss of 38.8 billion yen ($365.3 million) in the January-March period. Red ink was reined in from a loss of 70.7 billion ($665.6 million) the year before. But North American operating margin still amounted to a meager 1.3 percent for the full fiscal year ended March 31. Kobayashi said Toyota wants to boost that to 8 percent by 2020. Chief Competitive Officer Didier Leroy and North America CEO Jim Lentz are working on a plan to shore up profits in North America, Toyota’s biggest market, Kobayashi said. Wholesale volume in North America declined 2.5 percent to 675,000 vehicles in the quarter. In the U.S., Toyota has been struggling with a flood of vehicles coming off lease, rising incentives and a rush of consumers away from passenger cars toward to light trucks. Cars made up just 32 percent of total U.S. sales in the first three months of the year. But at Toyota Motor Sales U.S.A., which covers sales of both the Toyota and Lexus brands, cars accounted for 40 percent of the mix. To bolster margins, Toyota has been racing to lift output of light trucks. Toyota said this month it will spend about C$1.4 billion ($1.1 billion) upgrading two of its three Ontario assembly plants in order to build the next generation of the RAV4 crossover. Toyota has high hopes for the fifth-generation version. Last year, the RAV4 was the best-selling vehicle in the U.S. that was not a pickup truck, with sales of more than 400,000. Toyota has also been helped by lower spiffs on some nameplates, such as the redesigned Camry. 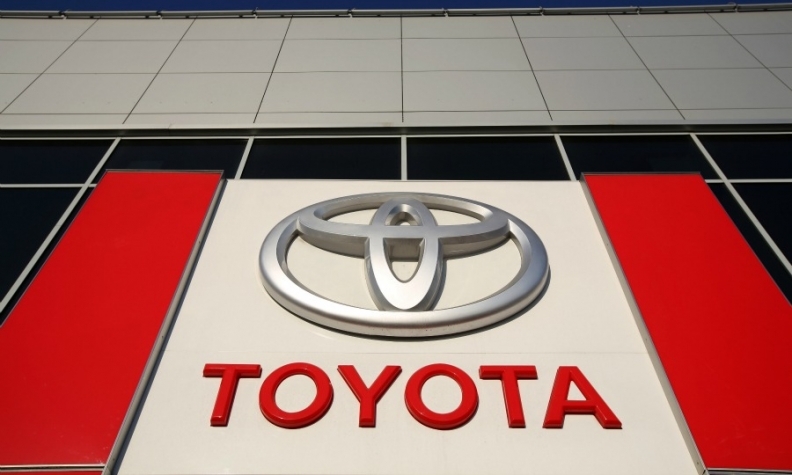 But Toyota Motor Sales’ incentive outlays still rose 5.6 percent to $2,451 per vehicle in the first three months of 2018, according to data from Motor Intelligence Corp.
Its increase was in line with the overall industry’s 5.8 percent advance, but Toyota’s average outlays were below the industry average of $3,746 per vehicle. Toyota’s European business was back in the black in the fiscal fourth quarter, posting regional operating profit of 13.8 billion yen ($129.9 million), from a regional loss of 64.9 billion ($611.0 million) a year earlier. European wholesale shipments rose 1.9 percent to 262,00 units. Toyota is fighting unfavorable exchange rates and plateauing demand in its biggest market, the U.S., where the maker of the Camry and Corolla sedans has been slow to react to the customer stampede from cars to light trucks. At the same time, it is racing to ramp up business in China and clamp down on costs to channel funds into next-generation technologies. Speaking at the earnings announcement, President Akio Toyoda said the industry is at a turning point where traditional automakers are at risk of being displaced by newcomers from China, Silicon Valley and the high-tech sector. Toyoda said the company must redouble its cost-cutting efforts and channel more profits into the hot new areas of autonomous driving, electric vehicles and connectivity. The company has already been splashing out cash in these areas. Last year, it created a joint venture with Mazda Motor Corp. and Denso Corp. to develop technologies for electric vehicles. Since then, it has brought Subaru and Suzuki into the fold. Toyota also has been aggressively vocal in saying it is developing next-generation solid-state batteries by the early 2020s to jump-start electric car-adoption. Earlier this year, it channeled out $2.8 billion to create another new company, Toyota Research Institute – Advanced Development, to develop the software that runs self-driving cars. Toyota announced last month it would install vehicle-to-vehicle transmitters across most of its Toyota and Lexus lineups in the U.S., beginning in 2021. And this month, the company said it would open a 60-acre site in Michigan to test autonomous vehicles in scenarios that are too risky to execute on public roads. In order to afford such investments, Toyoda said the company must redouble its efforts to control costs and be innovative in deploying its famed Toyota Production System beyond the assembly plants and into the offices and r&d centers. For the full fiscal year ended March 31, Toyota’s operating profit increased 17 percent to 2.40 trillion yen ($22.59 billion), from 1.99 trillion yen ($18.73 billion) a year earlier. Net income jumped 27 percent to a record 2.49 trillion yen ($23.44 billion) from 1.83 trillion yen ($17.22 billion) the year before. U.S. tax breaks, which reduced the corporate rate to 21 percent from 33 percent starting Jan. 1, helped pump up the net income for the full year. Revenue also reached a new all-time high, increasing 6.1 percent to 29.38 trillion yen ($276.60 billion), from 27.60 trillion yen ($259.84 billion) a year earlier. Wholesale volume dipped just a hair to 8.96 million vehicles, from 8.97 million the year before. Retail sales increased 1.9 percent to 10.44 million vehicles, from 10.25 million. Toyota was coming off a previous fiscal year in which full-year net and operating profits both tumbled. That reversal cut short a run in which Toyota had notched two-straight years of across-the-board records in full-year revenue, net income and operating profit. President Akio Toyoda warned in May 2017 that his company was headed for a second year of falling profit and ordered massive cost controls to prevent that from happening. Still, looking ahead, Toyota predicted operating profit would decline 4.2 percent in the current fiscal year ending March 31, 2019, undermined by a deteriorating foreign exchange rate. Net income is seen 15 percent lower, without the year earlier one-time gain from U.S. tax reform. Global wholesale volume is seen essentially flat at 8.95 million vehicles, with all regions expecting declines except Asia, where robust demand in China will power an increase.